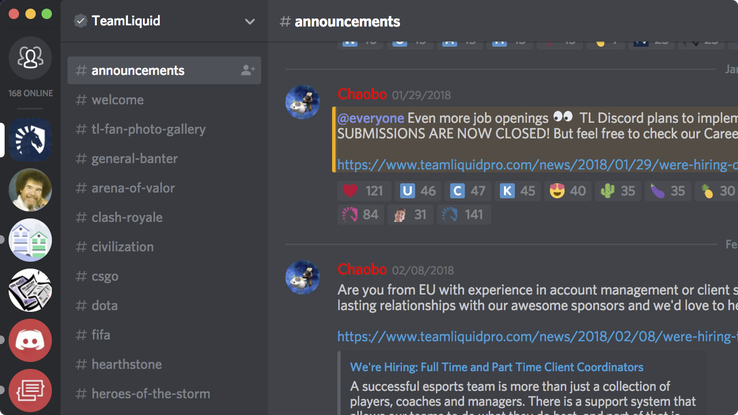 Discord, the voice and text chat app for gamers, is today announcing a new partnership with a number of eSports teams for the launch of Discord Verified Servers. Verified servers ensure that users know they’re communicating with an official source, similar to verified accounts on other social media platforms like Facebook, Twitter and YouTube. Alongside using these servers for their own team comms during play, pro teams can also use the platform to engage with fans, amplify social media, and give fans a place to organize community events such as viewing parties. Pro teams who are already on board to use Discord Verified Servers come from a handful of the most popular eSports games such as Dota, League of Legends, CS:Go, and Overwatch. These teams include Team Liquid, Cloud 9, Echo Fox, Team Envyus, 100 Thieves, and almost all of the Overwatch city league teams. Discord originally launched as a mobile game maker, with an iPad arena battle game called Fates Forever. In fact, the company took a top spot at the Disrupt Battlefield in 2013, but the game failed to catch on with users. In 2014, the company decided to pivot. CTO Stan Vishnevskiy saw the hole in the market. Discord was reborn, giving gamers a place to communicate in-game and talk trash, participate in group discussions, and more for free. The company has since raised nearly $80 million in funding and grown to 90 million registered users, up from 45 million in June 2017. The rapid growth of the eSports industry and an increase in streaming gamers (and their followings) have spurred the launch and growth of a number of gaming-focused startups, including MLG (acquired by Activision), Twitch (acquired by Amazon, and Discord. But Discord is taking a conservative approach to revenue, never charging for use of the core functionality but rather offering premium cosmetic upgrades to generate revenue. This model is also being used by Epic Games Fortnite Battle Royale, which is free to play but charges for the BattlePass, which lets you cosmetically upgrade your character avatar, tools, etc. Whether an expensive business like Discord, which must operate free voice chat servers not to mention pay sponsorship fees for top streamers, can create a subscription model that carries the load is a question for the future. But this partnership with eSports teams and orgs should surely encourage gamers to continue flocking to the platform.